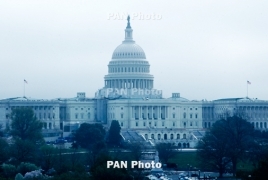 PanARMENIAN.Net - A new book titled "Congress and Diaspora Politics: The Influence of Ethnic and Foreign Lobbying", which studies the impact of lobbying efforts by domestic ethnic groups and foreign governments on U.S. policymaking, has recently been published by SUNY Press. The book explores, among other things, how the Armenian lobby has influenced American policy-making over the years. Furthermore, there is a special chapter titled "The Armenian and Turkish Lobbying, and the (Non-) Recognition of the Armenian Genocide by the United States." "Congress and Diaspora Politics" examines the impact of lobbying efforts by domestic ethnic groups and foreign governments on US policymaking," the publishers said in the description. "Over time, the number and variety of ethnic groups have grown, and foreign governments have increasingly turned to professional lobbyists rather than relying on their diplomatic corps to cultivate relationships with Congress. "The case studies presented here examine this new lobbying environment by focusing on Jewish American, Muslim American, and Cuban American interest groups as well as lobbying efforts by the governments of Turkey, Armenia, Mexico, and others. They explore the strategies, tactics, and resources utilized to impact policymaking. "The volume also offers perspectives of those who have worked on both sides of the lobbying equation—“a view from K Street” (the lobbying side) and “a view from the Hill” (the congressional side). Finally, challenges lawmakers face when Diaspora interests intersect with national interests are covered."